Eggs are a symbol of life and fertility around the world. Their rounded form is pleasing to the eye and to the touch. 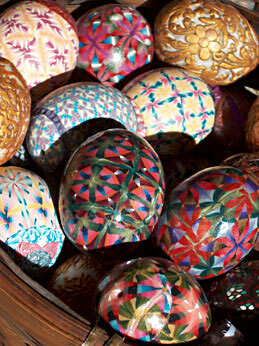 In making traditional Hungarian Pysanki eggs are dyed with a wax resist process to form gorgeous layers of color built up into tiny precise patterns and repeats. 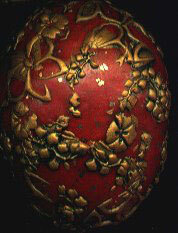 Some collectable eggs are enameled, or layered with costly metals. Eggs can be simply colored or lavishly encrusted with splendid and costly details, as in the Faberge versions, which were made of precious gold, platinum, diamonds and other gemstones for the delight of patrons including Tsars and Queens. Now eggs can be decorated with polymer clay in these and other styles too numerous to mention here–they really deserve a book all of their own! And, because there is a hole all the way through, these are by definition very large beads! Here’s a look at a new batch of eggs. When we talk about baking up a pan-full here at the Polyclay Gallery, its not usually about breakfast! 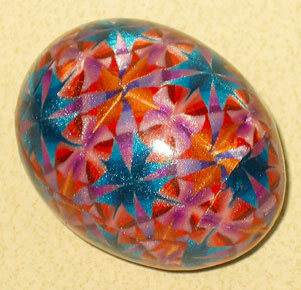 There are so many ways to decorate eggs with polymer clay, creating delicate and yet durable art collectables. Here are two eggs with geometric canes inspired by Sandra McCaw’s intricate and colorful polymer clay style and also by fabric quilts. Seminole style patchwork trim on traditional clothing is done with colorful strips of fabric, and these patterns are formed with colorful stripes of polymer clay–manipulated carefully. 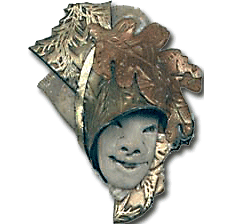 There are metallic and pearlized polymer clay colors available, and others can be mixed–red and gold, or black and gold; these make wonderful color mixes. Try mixing gold and silver for a lovely color that goes with both. Eggs can be buffed to a smooth sheen, or glossed with Varathane to really show the brilliance and depth of the mica bearing clays. Premo and Kato clays both have rich colors and mica bearing metallic or pearlized clays. Each lends itself well to many styles of caning and impressed techniques. Mixing and matching adds to the fun. The style shown below is done with sheets of clay cut into decorative forms with cookie cutters, placed over prepared eggshells and baked. Then some of the exposed areas are beaded with glass and metallic balls, or glitters. I particularly like Art Institute Glitter for its wide range of sizes and colors that withstand baking. Here’s how they look when they’ve been completed. Glass bits and metal, stone and some plastics can safely be baked at the temperatures used with polymer clays. Those decorative items that can’t take baking can be added afterwards. The varying textures of the surfaces catch the light in interesting ways, especially when hung on a Christmas Tree–or an Easter Branch–with decorative lights. 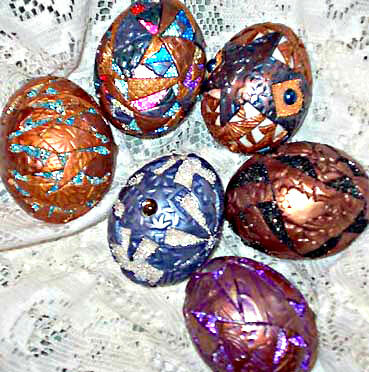 Another style of egg decoration involves cutting polymer clay pieces to place over the egg shell in a style that mimics filigree. You can learn how its done here. Some versions leave some egg shell exposed. All of the eggs seen on this page are chicken eggs, but there are other sizes available as well–goose eggs and ostrich or emu eggs are substantially larger. 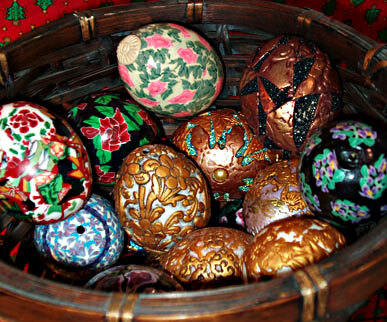 Also, larger eggs can be opened and meticulously lined and hinged to make treasure boxes in the style of Faberge. Use them as an addition to an egg collection, to decorate a whole tree or just a branch! These also look fabulous with an added silk tassel, and can be used to great effect as a drapery tie-back. This is particularly effective with velvet and Victorian motifs. 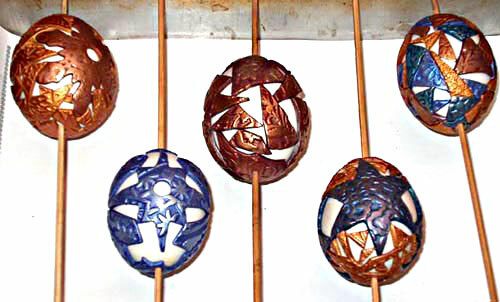 Another way to decorate eggs is by using slices of polymer clay canes applied to eggshells and rolled smooth, so that the egg is encased, then baked. You can see how the sun and moon face canes are built here. Varathane makes an ideal finish for a glassy shine, or a wonderful polished sheen can be buffed onto the egg. Buffing is particularly effective after sanding and when using translucent clays. 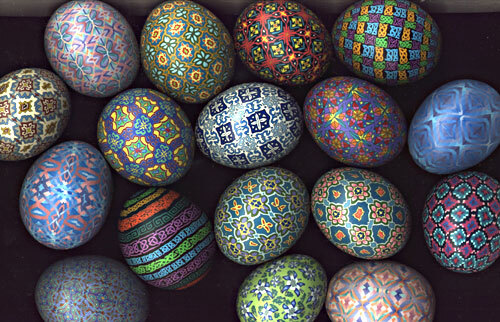 Many polymer clay artists enjoy making collectable eggs. Some are filled with miniatures, be-jeweled or cane covered. One of my favorite egg artists is Carol Simmons, whose precision and color sense always move me to wanting more of these little rounded works of art!